It is the Second World War. On every front, the armies and fleets of the Axis and Allied powers struggle for victory. But now, a new weapon strikes from the skies. Squadrons of bombers soar overhead, raining destruction down on the vehicles, troops, and ships below! 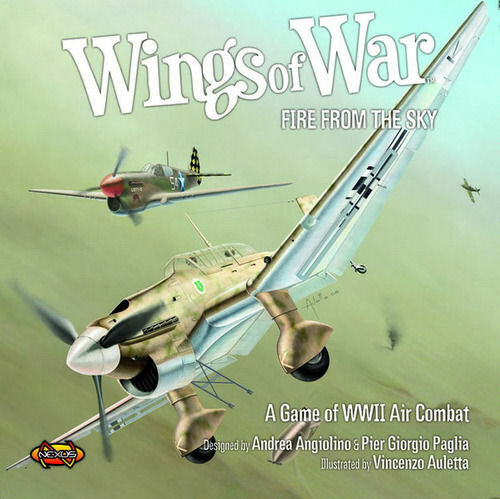 Fire From the Sky is the second Wings of War game set in World War II, introducing new rules and planes to the game of aerial combat. Dive-bomb targets in a Stuka, a Dauntless, or a Val, or try to stop them in a fighter! You can also dogfight in a Warhawk, Hien, Yak 1, Airacobra, or Falco II, all included in this set. Up to six airplaines can fly at once with the contents of this box. Each Wings of War box is a complete game that can be combined with other World War II Wings of War sets. Contents: 140 cards, 6 airplane boards, counters, 2 rulers, 1 rulebook.